Mystery Monday — Kawaii Box edition! Hello humans of the internet! 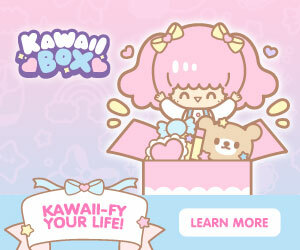 I got another Kawaii Box, just a few days after my birthday! It was like a birthday present to me! (I had a long day of putting together Peggy’s outdoor kennel so she can spend time running around when I’m not home instead of being cooped up in her crate. I would like to take a brief moment to say that I’m actually now an affiliate of Kawaii Box so if y’all want you can click on this button down here. I really hope that is a “learn more” button. We shall see. Now on to the fun stuff: a whole box of insanely adorable objects. Also, what do you think of my fabric backdrop? I found a giant piece of grey felt and it makes me happy. The note on top said that this is the Sakura Season box. Which I think is super exciting because sakura is cherry blossoms and I love flowers and pink so sakura is my jam. I’m actually really excited about this because it’s a little pill case and I have to take allergy and asthma medicine. If you don’t need medicine to breathe, you could also use this for keeping necklaces from tangling on each other. Or for sorting out those little perler beads while making art. Or vitamins. Or keeping up with rings. It/’s cute and useful! Look at this adorable character on this little wallet! Her tiny fan and tiny purse and tiny shoes! There is even a nifty little ID card that would make this prefect for a college student. Or a grown adult like me, that needs a new wallet because her reversible sequin wallet is broken. This is a little bracelet kit. I considered trying to make the bracelets but I thought that it would make a fantastic prize for the prize box in my sister’s classroom. She teaches middle school and some of the kids really like anime and kawaii things so I actually give a lot of these to her for the prize box. These are 100% going to become a photo display in my bedroom. Possibly of pictures from mine and Schulz’s Disneyland adventures over Christmas. Or pictures of my sister’s wedding. I’ll decide later. These beautiful sitckers. Love these. I usually include stickers on every letter I write. I write a lot more letters than the average 24 year old lady. I write to Schulz mostly. And finally this notebook. I don’t know if the quality of this notebook is apparent over the computer, but this notebook is beautiful. The binding in fascinating. I love this so much. and it matches the little desk calendar that also came from Kawaii box. It’s so excited. I really want to write or draw in it, but I also feel like I I’m not skilled enough for the notebook. So That was the Sakura season themed Kawaii box. It is super cute. It was so much fun to open and I can’t wait to make my photo garland with the cat clips and write some letters to Schulz. I hope you click on the “Learn More” button up there. I also hope that I added it to the page correctly and there is a “Learn More” button up there for you to click on. Your learn more button worked even though I am not going to subscribe. Our home is still full of the thousand stickers, toys and other stuff accumulated over the years. Does the same company that make Hello Kitty make these? Thank you for letting me know that the learn more button worked. Thks company curates boxes using a lot of different Japanese products. They do include Sanrio pretty frequently. I’ve a couple of Hello Kitty items and some little twin stars items, both of which are Sanrio. I see. Sanrio makes a lot of different things. It is a full range Sanrio store in Universal Orlando with Hello Kitty at the door.